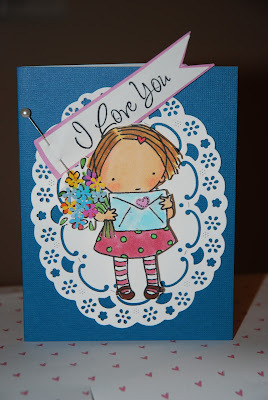 Welcome to Day #2 of the "Ticket To Love" Blog Hop, hosted by the very lovely Lissa Marie at www.somanycrafts.com. The adorable image on this card is a digi-image from Heather Ellis' "Pure Innocence" line. I colored her with Copics markers, added some Punch Bunch flowers to her bouquet, popped her up using Ranger super-deep dots, and adhered her to a die cut frame using a new-release Cheery Lynn "Swedish Spring Frame" die that I thought complimented her flower bouquet nicely. I made the pennant with a stamped (Hero Arts) sentiment and stuck it on a hat pin. I put the end of the pin into the foam pop-dot, for safety's sake. I like the contrast of the deep blue card -- a little change of pace for Valentine's Day. Do you have a favorite of these three? Please let me know! Time's up with the CardMonkey! Your next stop on the TICKET to LOVE HOP is JEN BLUE! I'm not sure Ellen- I LOVE those dressed-up hearts but today's card is VERY cute- the doily, the flowers, the pinned flag... great details! That is sooo precious. WoW ellen, I love it! I love this day 2 one the best because it has that wow factor! Beautiful Cards!! They are all fantastic! My favorite one is the Red & Black & White One! I just think it's so classy looking!! The hearts are so cute!! New Follower!! 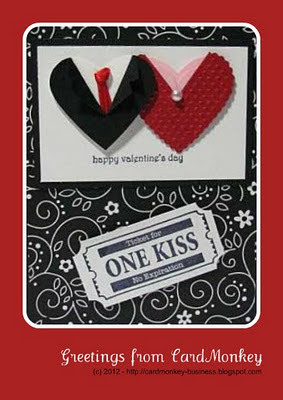 I absolutely love the first one, however, i ust say my fav is the one with the lil tux on the heart. super creative and great idea...I love it!!! adorable digi image. I like your one kiss card the most out of all of them. You are so creative! Always. Hope you're feeling better!!! love your cards. You colored that lil girl AWESOMELY!! I just discovered you today via a referral to your diy glue dots posted on CropChocolate.com and signed up for your emails right away. 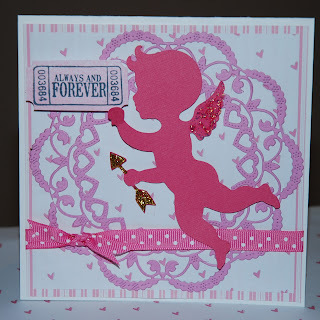 I love how you made his and her hearts on the last card and am really looking forward to seeing more of your work. My fave is the One Kiss card. I like dark colors, so the red and black appeals to me. Also, the way you made the man and woman hearts is very creative. I am a follower, my favorite car is the one with thr pink heart doily and cherub. Both your cards are fabulous! I think my favorite is the One Kiss, I love the black and red together. It is a different design with the two hearts embellished as a man and women heart and I love it!! I am already a follower.